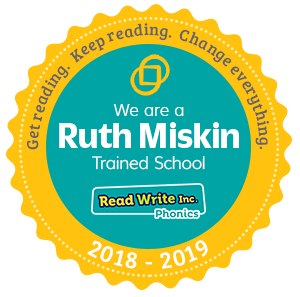 We are very proud to announce that our school has been awarded the '2018-19 Ruth Miskin Accreditation Badge' in recognition of our schools success running the Read Write Inc Programme! Children in EYFS and Key Stage One take part in a 30 minute daily Phonics session. Children are grouped according to ability and work in smaller groups with their Phonics teacher. All staff (teachers and teaching assistants) have been trained in how to deliver the programme. It enables every child to become a confident and fluent reader at the first attempt. Every child who completes Read Write Inc. learns to read fluently and confidently. Children begin the programme as they start school in Reception Class. The programme begins by teaching children how to recognise letter sounds. Pictures and rhymes are used to help children recognise the sounds quickly as well as supporting them to write the letters. When children are confident with letter sounds they begin to 'orally blend' letters to read simple words. As children grow in confidence and fluency they will then move on to reading whole sentences. At the beginning of Reception each session will last approximately 20 minutes per day. By the end of the year, children will build up to a 30-35 minute session every day. Children continue with the programme as they move up into Year 1. Children will continue to learn more complex graphemes and will be supported to increase their reading fluency. Children will also develop skills in comprehension and will be expected to answer questions about what they have read. Children continue the Read Write Inc Programme up until the end of the Autumn Term in Year Two. Some children will complete the programme earlier and some will need a little longer on the programme to fully develop their skills. Children who have completed the programme will then take part in class Guided Reading. Any children who staff feel need a little bit of extra support will be allocated a one-to-one tutor. This tutor will work with them daily to support them with any gaps in learning and increase their rate of progress. The sounds in Read Write Inc are split into 3 sets. You can view the sets and the writing rhymes for each sound by clicking on the link below.